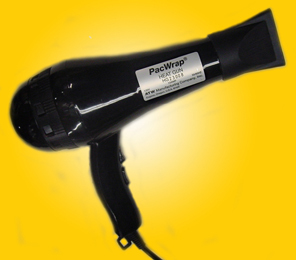 Your new PacWrap® Heat Gun was specifically designed to provide the perfect amount of heat and airflow needed for work with any common shrink wrap film, without burning through the film and creating ugly burn holes. The lightweight plastic case is made of Lexan (similar to the plastics used in football helmets). The motor and heating elements are "shock mounted" so no worries if it's accidentally dropped -- it will keep running beautifully. If you have a lot of packages to shrinkwrap, you may find it's easier to seal all the packages first, then shrink them down. If you have packages that have been handled and the shrink wrap on the package is starting to look wrinkled, you usually don't have to tear off the old shrink wrap film. Just use the PacWrap® Heat Gun again, and "blow away the wrinkles." Refresh your packages like new, in seconds! 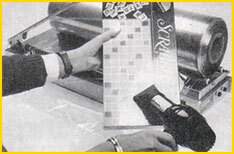 Once your package is sealed in the shrink wrap, hold the gun's tip near the shrink wrap film at about a 45-degree angle. 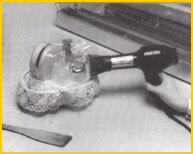 Don't hold it 6 inches away from the package and "wiggle it" like you have had to do using the old style heat guns. Those guns were designed to peel paint off of wood, or remove glued on flooring and burn too hot for shrink wrap films. With the PacWrap Heat gun you can literally get the diffuser tip in direct contact with the film and create the perfect, secure, shrink wrapped package every time! Shrink the edges of your package first, then the back and finally the front or "retail side" of your shrink wrapped package.. Your new PacWrap® Gun is warranted for two years from the date of purchase!. If you don't have a PacWrap® Heat Gun, call 800 759-3388 and give one a try! 30 Day Money Back Guaranty! Call us at 800 759-3388 We are open 8 to 5 Pacific Time or email us! For complete current or special pricing, call 800-759-3388, or email us at: sales@atwmfg.com We also offer a complete line of shrink wrap accesories and shrink wrap supplies as well as shrink tubing, dome shrink bags, shrink bands, high speed overwrap machines, L-sealers, shrink tunnels, non stick PTFE seal tapes and cloth, service kits and repair kits for almost any brand of heat sealing or bag sealer equipment. © Copyright 2003 - 2019 ATW Manufacturing Company, Inc.